I haven't been to Denver in years so it was good when I had to go there for work. I also took the opportunity to have lunch with a college classmate, whom I haven't seen in years. She brought her husband and her very cute three-year-old daughter along, and we strolled through the Lower Downtown area of Denver before deciding to try out the Samba Room. The restaurant had chic decor and looked like it would be a very hip place after dark, but it was pretty empty for lunch. The lunch menu was very reasonably priced and they offer "Latin lunch boxes" that ranged from $10.95-$12.95 that included soup, salad, an empanada, entree, and dessert. 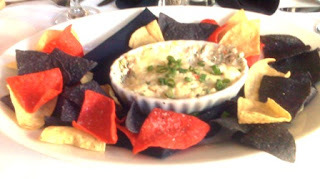 We started off sharing a three-cheese crab dip which was pretty tasty. The portion wasn't very big though, as we quickly ran out of the dip and we still had a lot of chips left. 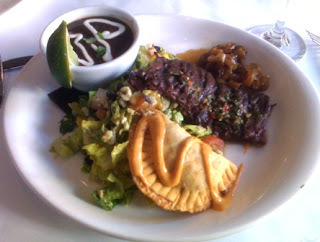 Then we each had ordered one of the lunch boxes - I got the one with the skirt steak as the entree. The soup and salad were not bad but nothing too special, but the corn empanada was nicely flavored. The skirt steak was a good size and had a little kick to it. We also got a chocolate pudding for dessert that was quite rich. Overall, I can't say I was blown away by the food, but it was lunch and the value was definitely very good. If you happen to find yourself in downtown Denver for lunch one of these days, you may want to pop in for a try. The empanada was good. Well, if you ever go to Denver, I would recommend Texas de Brazil first. Of course, if you are staying a few more days, then this is worth checking out. i'll be going to Denver later this year - Texas de Brazil it is then!! Thanks for the tip. tic due to its unsecured naturally. review is 'focusing people's minds'. However, only fees and charges don't ensure the quality of services simple loan agreement this typically includes uk resident verification, place of employment, name, license, income statement, banking account number and desired loan amount. using the rate on other varieties of forms of mortgage modifications, Zandi said payday loans in virginia most people who wish to buy a manufactured home may wish to get yourself a title 1 loan.